The Courageous Story of Zosine Emilienne Verstraeten-Lafili and "her nephews"
All I knew about Zosine Lafili up until early 2006 was that there was a Mr. and Mrs. Verstraeten of No. 80 Kwakkelstraat in Turnhout Belgium who had hidden allied airmen, (sometime afterwards this became No 84). This information I knew from an undated photograph of the couple in the Knox -family album and from my father's recollections written fifty years later. Here he described her as being "in her late 30s or early 40s. She was quite tall and on the thin side. 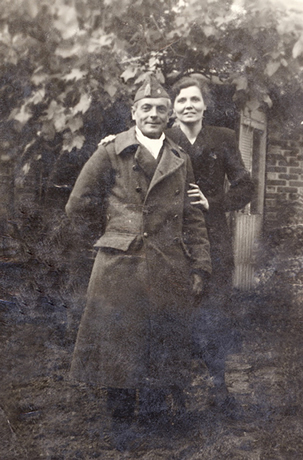 Her husband was a soldier in the Belgian army and had been a pow in a German camp. Mme Lafili was a city woman, she was intelligent, kind and had a good sense of humour. She was a fluent French speaker, although Turnhout was very much a Flemish town..."
Kamiel Mertens decided to leave no stone unturned in his quest to find out what had become of Mrs. Verstraeten. He left a letter in every letterbox in Kwakkelstraat (street) in the hope that somebody might have some recollection. A week later he was rewarded with a phone call from Mrs. Verstraeten's former neighbour. The neighbour had been a teenager in 1944 and remembers how she would see young men arriving through the back doors ("my nephews" according to Mrs. Verstraeten). She recognized the back of the house from the picture. With the knowledge this was the correct person and place - Kamiel was able to research the archives of the Town of Turnhout. He eventually found her full name -- Zosine Emilienne Verstraeten-Lafili. Kamiel now got to work in all the historic and post war archives, document centres and Fund for Social Security (the actual name of an older institution "Ministerie van Wederopbouw") - a special Fund relating to the Resistance Movement established immediately after the war to reimburse and give official status as "members of the armed resistance" for the costs incurred for shelter, food, medical supplies, clothes, documentation, and transportation for the individuals they had rescued. Zosine Emilienne Lafili was born in Leuven on 17th November 1902 to Jean-Gustave Lafili and Marie-Louise Willems. On July 22 1927 she married Fran�ois Verstraeten in Leuven. We have not established yet when they moved to Turnhout. By 1940 Corporal Verstraeten, a soldier in the Belgian Army, was a POW in Germany. It would appear from the records that Mrs. Verstraeten-Lafili was a housekeeper for a Turnhout family active in the resistance. They had rescued an airman (Kleinman) and had asked Zosine to hide him at her home in Kwakkelstraat 80. Upon further research it is undoubtedly the same Theodore Kleinman from the 349th Squadron who joined the 100th Group and who stated after his return "the bail-out occurred about 10 miles SSE of Turnhout, Belgium and continues: "After contacting an underground unit I was placed in a house in Turnhout..." (see notes available on web). There is a listing from the Brussels Ministry that from February 4th 1944 till September 20th 1944 Zosine Verstraeten-Lafili hid at least twelve allied pilots and airmen. These included 2nd Lt .Theodore Kleinman, USA; Sgt. W. Lynch, UK; F/O John Maunsell, UK; Fl. Lt. Eric Mallet, Canada; Kenneth Cyril Sweatman; Canada: F/S Reginald Brookes, UK; F/S Peter Knox, Australia; Captain Henry C. Griffis, USA; Sgt Daniel M. Cargile, USA; F/S Arthur Rae, Scotland, UK; F/S Philip Tweedy; F/Sgt Roy Reading, UK; Sgt Roy Martin, USA. Navigator on B-17G 42-39799 XR-M 'Dobie', from the 100 Bomber Group / 349 Bomber Squadron. T/o Thorpe Abbotts, Norfolk. Frankfurt raid -- aircraft lost due to Flak on 4 February 1944; Kasterlee, Belgium. Of the crew 2 evaded; 1 KIA and 7 PoW. 22-23 Apr 1944 - Believed to have crashed near the Belgian/Dutch frontier. According to W. R. Chorley's book "Royal Air Force Bomber Command Losses of the Second World War 1944" there is a Sgt W. Lynch who was "arrested while being hidden at Antwerp". This could well be the same Sgt Lynch- see also Reg Brookes. Sgt Lynch was looked after by Mr. Leemans in Geel - husband of Mrs. Jeanne Leemans-Schlesser. Information to be confirmed. 3) F/O John R. Maunsell - 57 Sqn Lancaster I LM115 DX-M Op. Wesseling T/o 2306 21-22 June, from East Kirkby; Crashed at Oud-Turnhout (Antwerp) 3 km E. of Turnhout. Also on aircraft - F/O A F Bayley RAF (KIA); W/O T F Beecher, RAAF (KIA); Sgt. J H Donovan, RAF (KIA) (buried at Schoonselhof Cemetery); Sgt R Hessman, RAF, (PoW); F/S Q D Naysmith, (evaded); Sgt V L Marshall, RCAF, (PoW). John Maunsell went to Mr. Martin (member of Resistance) - Ravelsche Steenweg 13 in Ravels. The following 10 airmen went from Turnhout to Brussels via Zosine Lafili and her Resistance colleague Albert Gevers from MOL, to Mr. De Meyer No 2BB/16/111/22? - living at Victoriestraat 102 in Brussels. The airmen were handed over at the "Grande Place" in Laeken which is a suburb of Brussels (home of the Royal Castle). Also on aircraft - F/O R A Irwin RCAF (KIA); Sgt W G Wakely RCAF (KIA); Sgt G F Freeman RCAF (KIA); F/O W J Elliott RCAF (evd); Sgt M Muir RAF (evaded until captured and held in St.Gilles Prison. Abandoned by the guards 12 Sep 44 he escaped]. F/S Poppa RCAF pow [was interned in Camp L7, PoW No.126); Mallett (see above) Funeral services for the three who died were held on 30th May at St-Truiden; their remains have since been taken to Heverlee War Cemetery. 22-23 Apr 1944 from Grimsby, believed to have crashed near the Belgian/Dutch frontier. Note: Reg Brookes was hidden with Peter Knox by the Sterckx family in Geel prior to moving to Turnhout. Those killed were buried at Antwerpen-Deurne. They have been subsequently re- interred in the Schoonselhof Cemetery. Sgt Lynch was arrested whilst being hidden at Antwerp. Also on the aircraft: P/O W.J.Shaw (KIA); Sgt W.H.Lynch (PoW); F/S K.Morgan RAAF (PoW); F/S R.Brookes (Evd); Sgt J.Ensor (KIA); P/O G.H.Williams (KIA); Sgt R.A.Bacon (PoW) - was interned in Camps L6/357. PoW No.3696 with F/S.K.Morgan, PoW No.3656. Sgt Lynch was sheltered until captured 6 Jun44 with the Cannaerts family in Heultje, (Brussels or Antwerp? ).Interned in Camp L7. PoW No.122. The two ladies of the Cannaerts family still have his uniform and in April 1998 made a request for his whereabouts. Radar Navigator on B-17 Pathfinder aircraft 42-97564 from the 100 Bomber Group / 418 Bomber Squadron (some records also show this aircraft to be known as the Belle of Berlin). T/o Thorpe Abbotts, Norfolk. Merseburg raid -- aircraft lost due to Flak on 20 July 1944; crash landed Leuven, Belgium. Left Waist Gunner on B-17 Pathfinder aircraft 42-97564 from the 100 Bomber Group / 418 Bomber Squadron (some records also show this aircraft to be known as the Belle of Berlin). T/o Thorpe Abbotts, Norfolk. Merseburg raid -- aircraft lost due to Flak on 20 July 1944; crash landed Leuven, Belgium. 7) F/S Arthur M. Rae - 76 Sqn Halifax III MZ623 MP-P Op. Aachen T/o 2241 24-25 May 1944 from Holme-on-Spalding Moor. Cause of loss not established. Crashed at Arendonk (Antwerpen), 9 km E of Turnhout. Countries. Also on aircraft: W/O F. Bishop (PoW); Sgt W.T. Mays (PoW); F/O T.H. Greer (Inj); F/S W. Cliff (PoW); Sgt J. Danes (PoW);Sgt C. Cassidy (PoW). W/O F. Bishop was interned in Camp L7. PoW No.4, with Sgt C. Cassidy PoW No.9, F/S W. Cliff, PoW No.11, Sgt W.T. Mays, PoW No.37 and Sgt J. Danes PoW No.15. F/O T.H. Greer was confined in Hospital due injuries. No PoW Number. 8) F/S Philip Tweedy DFM - 635 Sqn Lancaster III ND819 F2-M Op. Duisburg T/o 2249, 21-22 May 1944 Downham Market - Crashed at Luyksgestel (Noord-Brabant, Holland) near the Dutch border 12 km SW of Valkenswaard. (Per W R Chorley: F/S Tweedy had served with 76 Squadron, details of his DFM having been published on 14 September 1943, he had flown with Norwegian, Lt E. Sandberg. The following on the aircraft were: Sgt E J Rowlands RAF (KIA),(he rests in Nederweert War Cemetery; F/S M B Rumbles RAF (KIA); F/S L J Making RAF (KIA); F/S A A Jepson RCAF (KIA),(these three buried at Eindhoven General Cemetery Holland); W/O G A D Mould (commemorated on panel 214 Runnymede Memorial). W/O J A Porter, RAF, initially evaded until captured 16 Jun 44 and interned in Camp L7, PoW No.278. Dorsal Gunner on B-17 aircraft 42-107225 from the 425 Bomber Group / 731 Bomber Squadron. T/o Deopham Green, Norfolk - aircraft lost on 9 August 1944. Please read the section on Col. Neels in Kamiel Mertens' book: "Balen tijdens de tweede wereldoorlog" pp 425-428. It is likely that Peter Knox actually met Griffis and Cargile in August 1944 as they would have been together from August 12 to August 14 and helped translate French for them - he refers to meeting two US airmen from the Flying Fortress who were being hidden at 80 Kwakkelstraat - Among the many Resistance contacts were Jules Theodore Lafili, Avenue de la Toison d'or 23 in Brussels. He was Mrs. Verstraeten's brother. He also hid many airmen and worked with the other members of the Resistance. According to records in the Brussels Archives, Zosine Verstraeten-Lafili not only helped allied escaped airmen, she assisted in the escape of Belgian nationals from German labour camps and was active in passing information on bombardments related to the allied command centres including disruption to communications, road and rail. Zosine transferred falsified documents including id-cards and work permits for members of the resistance and escaping airmen. She would pick up these falsified documents from the home of Mr. De Meyer in Victoriestraat 102 Brussels. She was able to hand over these documents to a member of the Arendonck Resistance Group - these were witnessed by R. Donders. "King's Medal for Courage in the Cause of Freedom"
Jacques van Bael - arrested by the Germans, locked up in the Camp of Flossenburg Germany where he died on April 25th 1945. (The information above was obtained by Kamiel Mertens through different records dating back to 1950). Mr. Frans Nevelsteen and his wife Mrs. Dimphna D'Joos (both were arrested along with their son Karel and sent to KZ in Germany. Father and son died in the KZ Dora (Mittelbau-werke V1 and V2) (per Kamiel Mertens Research). Tweedy and Rae were also looked after by Louis S'Jegers and Marcel and Madeleine Peeters-Driessen of Geel . There is written testimony on Zosine Lafili by 2nd Lt Theodore Kleinman in the archives in Belgium praising her courage and intellect and documents "if anybody in Belgium should receive a medal, it must be Zosine LAFILI". Kleinman would know as he spent seven weeks at the home in Kwakkelstraat. A communique was directed by President Dwight D. Eisenhower to "express to Zosine Verstraeten the gratitude and appreciation of the American people for gallant service in assisting the escape of allied soldiers from the enemy". I am sure there is plenty more to say about the courage and heroism of Zosine Lafili and those whose lives she saved at the peril of her own - this is the information we have available as of February 2010. It also gives a glimpse of those others, including her brother Jules Theodore Lafili who did so much to save so many. Additional research into USAAF MACR (Missing Air Crew Reports) by Howard Heeley.